The Greenville Dance Festival is for dancers to come together as a community, broaden their experiences in dance and to meet other dancers who share the same passion for dance. The Greenville Dance Festival is for dancers and members of the community in the Upstate and will conclude with an informal performance. 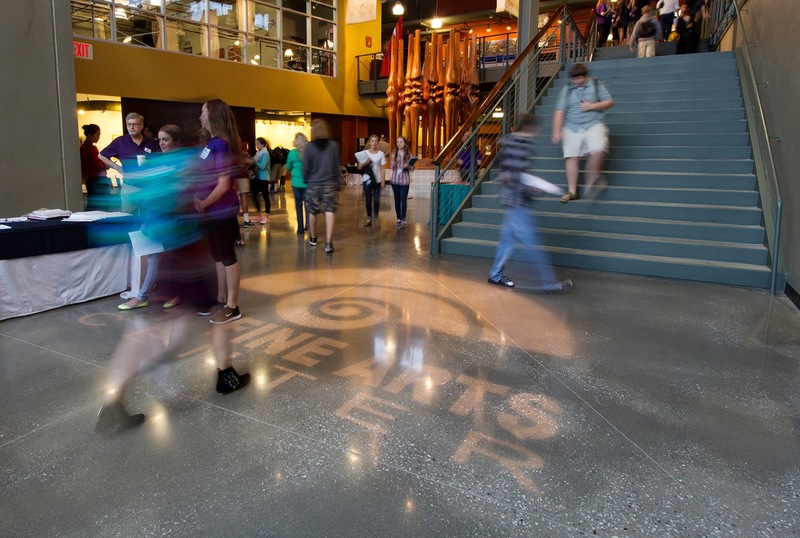 Classes will be held at the Fine Arts Center and Wade Hampton High School. There are classes for adults as well who are interested in learning and experiencing more about dance. The ages for the Festival are from grades 4-adult and the goal is to offer many styles of dance including Modern/Contemporary, African, Salsa, Classical Indian, Stage Combat, Slavic Folk Dance, Alexander Technique, Graham Technique, Pilates with Props, and of course Ballet, Jazz, Musical Theatre, Improvisation among others. 5-6 classes will be offered during each of the 5 one-hour sessions. Professional Development for Teachers with Greenville County Schools is available for several classes. Brian McGinnis is our special guest teaching modern/contemporary dance. He has performed with Hubbard Street Dance Chicago, David Parsons Dance Company, Lar Lubovitch Dance Company among others. Mr. McGinnis has performed in 45 international countries and in performing arts venues such as Lincoln Center Out of Doors Festival, American Dance Festival, Spoleto Festival in Italy, Jacobs Pillow Dance Festival, and the Chicago Dancing Festival. In 2009 he was a commissioned artist with the Peace Center for the Performing Arts and has conducted teaching residencies at Loyola University, Skidmore College and Marymount Manhattan. In 2012 Lar Lubovitch won the Prix De Benois Award for “Crisis Variation,” which he set on Brian McGinnis and Kate Skarpetowska. He has been a guest artist in Dance at the Fine Arts Center and students of ALL ages love his classes! 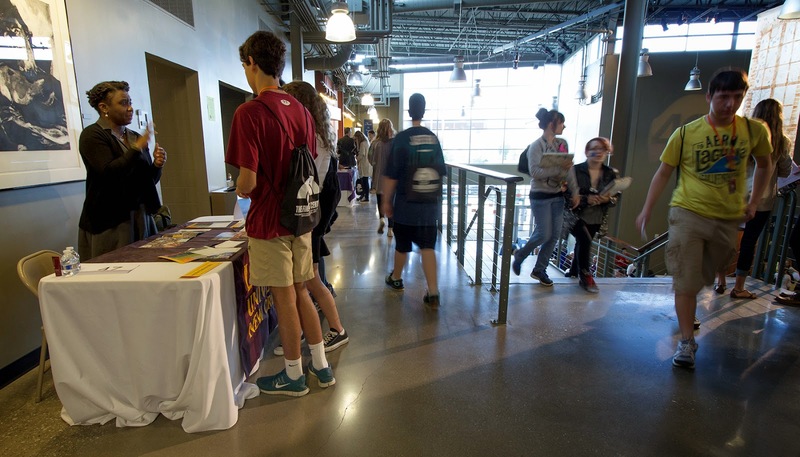 College Day at the Fine Arts Center has been an excellent opportunity for students to learn more about general college admissions requirements and college programs available in their arts disciplines. This year's College Day was Friday, September 26. This year we had approximately 100 representatives to attend our program. A sampling of the colleges represented: Cleveland Institute, Boston Conservatory, Columbia College-Chicago, Carnegie Mellon, James Madison, Ohio State, Loyola University, Virginia Commonwealth, UNC School of the Arts and many other local and national schools. All students had an opportunity to ask questions concerning their interests in arts education and careers during two sessions on September 26th. Parents were encouraged to accompany students to the morning and afternoon sessions. 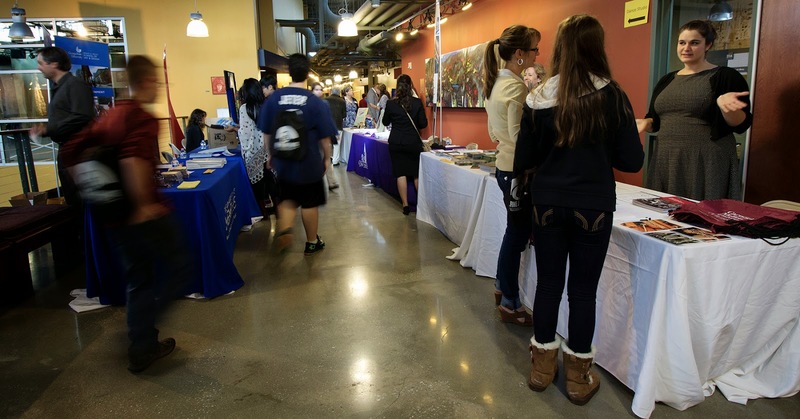 In addition to the College Day activities, the Fine Arts Center had an Open Studio/College Night on the evening of September 26th. College representatives had the opportunity to visit studios to hear performances and view student work. 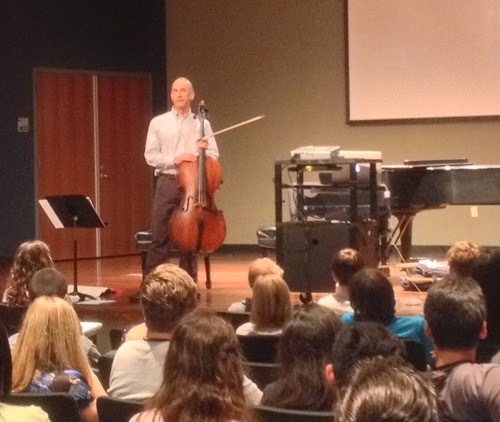 A new element to the program this year was a financial aid workshop held in the Fine Arts Center Recital Hall. The speaker for the program was Michelle Jordahl, financial aid counselor at Maryland Institute College of Art. Ms. Jordahl presented information about the financial aid process from completing the FAFSA through accepting a financial aid award. Greenville-based artist Katy Bergman Cassell embraces enameling, a technique that fuses glass to metal, using heat. Join her as she demonstrates the seamless connections among painting, drawing, and metalworking. All Sundays at 2 programs are free and are presented by Duke Energy. Katy Bergman Cassell earned her BFA in Enameling from the Cleveland Institute of Art and her MFA in Metals/Jewelry/Enameling from Kent State University in Ohio. She has worked as an archaeological illustrator in India and as a museum educator at the Metropolitan Museum of Art, the Cloisters, in New York, and at the Western Reserve Historical Society in Cleveland, OH, all of which were huge influences on her art. She taught at the college level for 8 years before joining the faculty of the Fine Arts Center where she is Visual Art Department Chair. She was awarded a prestigious National Artists Teachers Fellowship in 2012 and used the funds to travel to England to work with famous enamelists and explore the country. Highlights included visits to the Jurassic Coast, a behind-the-scenes tour of the Victoria and Albert Museum enameling archives, and the British Museum. She was a South Carolina State Parks Artist-in-Residence in 2012 and 2013. She is a member of the ArtBomb Studios in Greenville and has been consistently exhibiting art nationally since the 1990’s. She has recently exhibited her necklace Gastropoda at the Morris Museum of Art in Augusta, GA,and has had seven solo shows, three of which were titled Connective Patterns which traveled to Nevada, Florida, and South Carolina. Her artwork has been published in 500 Enameled Objects by Lark Books in 2009, The Art of Enameling: Techniques, Projects, and Inspiration by Linda Darty in 2005 and her work has also been featured in Metalsmithmagazine, Cleveland Scene magazine, At Home in the Upstate, and The Greenville News. having appeared here several times with the Kandinsky Trio. UPDATE: The deadline to submit work for "The Ties that Bind: FAC Alumni" has been extended to Wednesday, October 1, 2014. 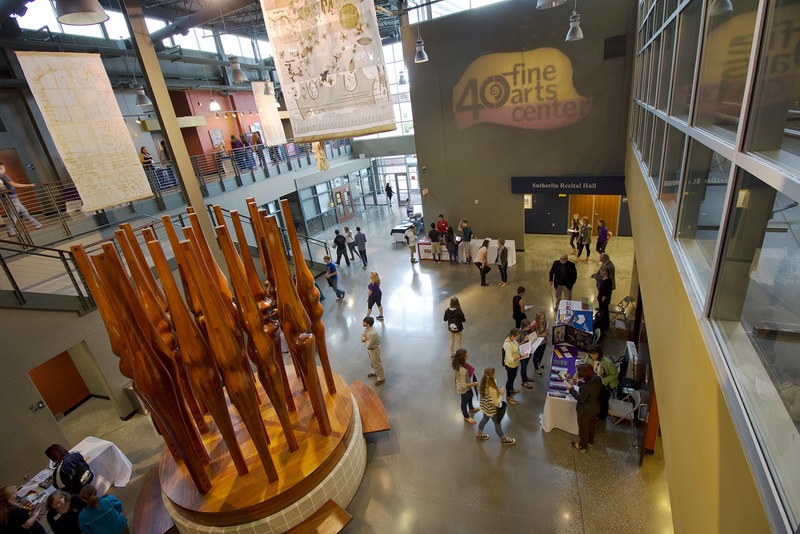 To celebrate our 40th anniversary, the Fine Arts Center is hosting a four-part exhibition series that will celebrate the work of our past and present Faculty, Alumni, our Community, and our current Students. Since this will be our anniversary year, many other special events are planned in conjunction with the exhibits and will involve the other FAC departments as well as the community. Through the Alumni portion of the exhibition, we would like to highlight your recent artistic achievements, demonstrating to the Fine Arts Center faculty, community, and students the dynamic success of FAC Alumni. We are excited about this upcoming series and very much looking forward to seeing your work. Please see the attached prospectus for instructions and dates in the link below. Please feel free to email Gallery Coordinator, Rebecca Owens at rdowens@greenville.k12.sc.us or me at rfincannon@greenville.k12.sc.us if you have any questions regarding Ties that Bind: Alumni, the series, or the Sheffield Wood Gallery. Please share this with any classmate or other Alumni you may know to help us get the word out! In case you weren't able to see Fine Art Center's Maria Parrini perform at her senior concert this past August, here is a video of her performance. It is fabulous!